She felt like she was lugging home a bag full of bricks. In reality, it was just 3 lesson plan binders, 2 textbooks, and about a bazillion hours worth of grading. No, this wasn’t an abnormal day. Tracy always hauled her teacher bag home, full of papers she knew she would never actually finish. But that’s just part of teaching, right? Par for the course. Our work follows us home then follows us back to work, and we’re never really free of it. We basically live a 24/7 stress cycle that we just have to survive until summer rolls around and we can finally breathe again. I mean, that’s the only way to be a good teacher, right? Tracy used to think that overflowing teacher bag was somehow essential to her success as a teacher. But she doesn’t think that anymore. In fact, she’s realized something quite different. 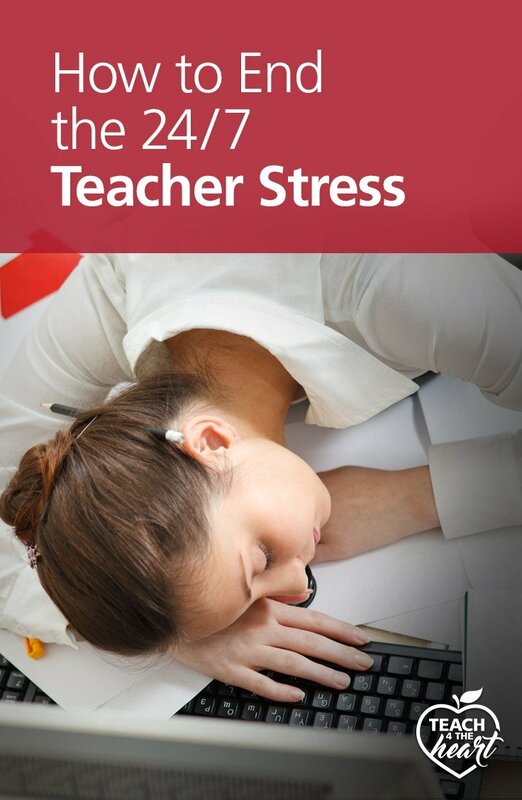 Teaching does not have to be an endless struggle of stress, overwhelm, and exhaustion. Tracy learned how to control her work hours, finally find some balance, and still be an amazing teacher. When we talk about ending the teacher stress cycle and finally finding balance, there’s really two areas we need to manage: our time and our focus. Managing time means developing systems to accomplish our tasks more quickly and efficiently. It also means, cutting out unnecessary tasks, building boundaries around our time, and avoiding unintentional breaks. 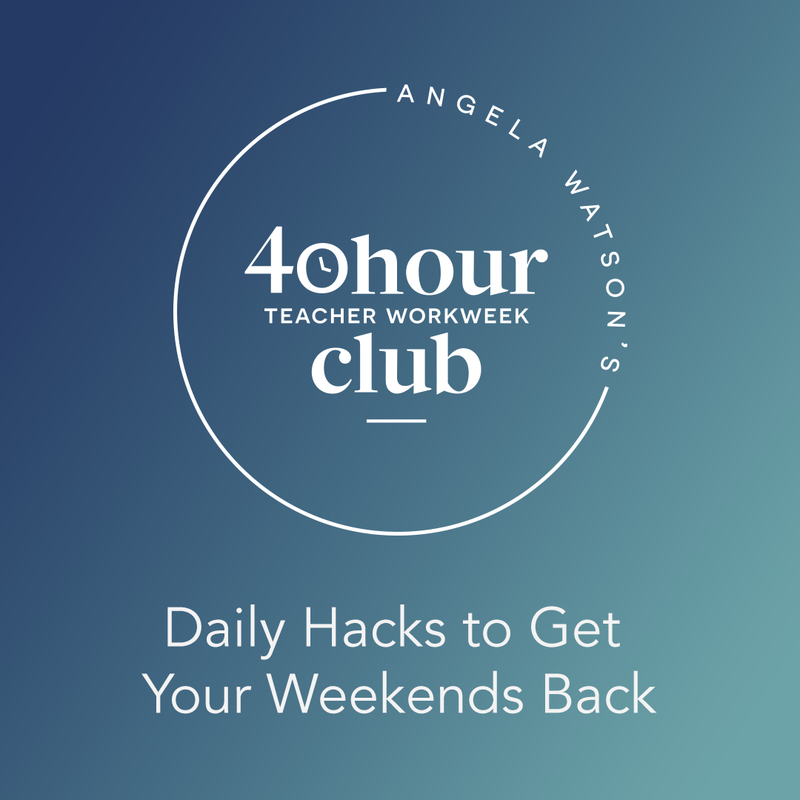 Tracy learned all this, and more, in the 40 Hour Teacher Workweek Club, which I highly recommend and will tell you more about here in a minute. But if we want to stop feeling so overwhelmed, we must also manage our focus, or our mental energy. When you DO get a finally get a few minutes to work, can you focus & actually accomplish something? Or do you end up hardly getting anything done because you used up all your mental energy trying to figure out what to do? Our minds have enough to worry about during the day without trying to constantly figure out what task we should tackle next. But when we develop a system that helps us keep track of our tasks and organize them in a simple way, we free up our minds to actually think. And we can save more of our mental energy for the things we really need our creative brainpower for – like coming up with good lesson plans. When our minds are more focused (and less burnt out), we accomplish more in less time and feel good about it, too. 1. Develop a start-of-day and end-of-day routine. Now of course you aren’t always going to be able to finish these routines. We are teachers, which by definition means we’re going to be interrupted. But if you develop these routines, you’re going to accomplish these tasks way more often and way more efficiently than you would if all these things were just part of your general mental to-do list. Next Step: Think about the things you currently do at the start & end of your school day. Are these tasks the best use of this precious time? Are there other things that you should or would like to be doing every day? Write down a tentative start-of-day and end-of-day routine. Then adjust it over the next few weeks until you’ve fine-tuned an effective routine. 2. Write down all your to-do’s. Too often we treat our brains like a filing cabinet, trying to stuff all the information we can in there (including all the random things we need to do) and hoping we can remember it all. I don’t know about you, but every time I try to keep my to-do list in my head, I end up feeling super stressed. And it’s no wonder why – I’m spending so much of my mental energy trying to keep track of all the tasks I have to do that I have no mental space left to actually accomplish any of them. But the second I actually write down a to-do list, I feel free. Yes, I still have to do all these things, but they’re written down, and I no longer have to worry about forgetting any of them. With this truth being so obvious, I’m really not sure why I backslide periodically to mental to-do lists. But if you’re like me and aren’t always consistent with writing down your tasks, today is the day to change that. Next step: Write down every single task that you need to accomplish, whether it’s for school, home, or anything else. Whether it’s due now, next week, or 5 months from now. Get everything out on paper so that you don’t have to carry it all around in your mind. If the mental to-do list will destroy your mental energy, its cousin, the mile-long to-do list, will kill your motivation. You know what I’m talking about. You sit down for your planning period and pick up your to-do list only to be reminded that there are literally 31 things you need to do. Your mind panics (just a bit) as you frantically try to figure out which of these bazillion tasks you should tackle first. So what’s the answer? Intentional procrastination. When we’re staring at 31 items our brains tend to get a bit overwhelmed. But if we say, “I don’t need to worry about these 6 items till next month, these 12 until next week, and these 9 can be done on Thursday or Friday,” then suddenly we only have 4 items left to do today. You see, I’m normally the type to say “Here’s my to-do list. I’m going to cross off as many times as I can today.” But, honestly, this approach doesn’t always work that well. It doesn’t motivate me very well because there’s no clear finish line. And no matter how many things I cross off the list, I tend to feel bad about what I didn’t finish instead of feeling good about what I did. What do you think that does to my productivity, much less my stress level? But recently I’ve changed it up. I’ve started putting only a few important items on my daily to-do list. And I’ve found myself actually accomplishing all or most of them, feeling a whole lot better about my day, and – best of all – not feeling nearly so stressed about everything else because I’ve intentionally left it for another day. Next step: I’ve made this really easy for you & created all the to-do lists you need. Click here to get the Intentional Procrastination To-Do List System (absolutely free). This system will help you separate your to-do list into separate lists. You’ll make one (short) list for today and put everything else under one of the following categories: tomorrow, this week, this month, next month, and this year. Then, make it part of your daily routine (either end of day or start of day) to choose the next day’s to-do’s. Determine to only choose a few important to-do items that you can realistically finish during the day. 4. Designate certain tasks for specific days of the week. The more we can organize and pre-determine when we’ll do certain tasks, the less mental energy we have to spend trying to figure out when we’ll fit them in. 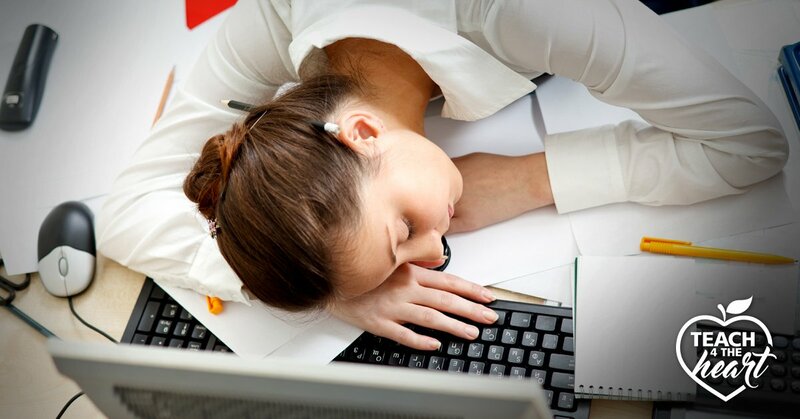 One powerful strategy is to designate certain tasks for certain days of the week. Let me give a personal example: I recently found myself resenting many of my household responsibilities (like paying bills, tracking our spending, or ordering a new smoke detector). I could never seem to find time for them and felt like they were intruding into my time to write for Teach 4 the Heart. As you can imagine, I was getting more and more frustrated. Now I’m home right now, so my situation’s a little different. But the concept is the same. What tasks always feel like interruptions? What items do you never seem to be able to find time for, even though they have to get done? Try designating a certain day for them. For example, you could say, “I’m going to do all my non-urgent parent communication on Thursdays.” So anytime during the week that you think, “I should probably update Emma’s mom about her science test,” instead of stressing about when on earth you’re going to do that you just write it down on your Thursday list. Then on Thursday you knock off all the emails & phone calls at once. Note that this wouldn’t be the only thing you did that day, but it would be a major theme for the day. 5. Designate and guard your off hours. If you want to feel balanced and lower your stress levels, you have to take time off. This means setting boundaries around your time and choosing when you will stop working. You may need hard lines like, “I will go leave school by _____” or “I will only work for 1 hour this evening.” Don’t be afraid to use a timer and to have your spouse or friend keep you accountable. But for the time off to be sufficiently refreshing, you need to do more than just not work. You need to let your mind take a break, too. That means no talking about work and no thinking about work. At all. This idea was somewhat revolutionary to me at first. You mean I shouldn’t be thinking about work all the time!!?? But when am I going to come up with solutions to all these problems!? But here’s the truth: Yes, we can (and probably should) use some of our off-hours to brainstorm about teaching, but we also desperately need some time that is truly off. Time where we refuse to think about work and let our minds wander elsewhere. Time to truly let our minds refresh and rejuvenate. You’ll be amazed how less ominous Monday morning is when you’ve truly let your mind refresh over the weekend. When you implement these 5 practices, you’ll be amazed at how much better you can focus, how much more you’ll get done, and how much of the stress will fall away. But this is just the tip of the iceberg. We talked about managing our focus, but we hardly even touched time-management and actual time-saving techniques Tracy learned in the 40 Hour Teacher Workweek Club. The techniques that allowed Tracy to finally ditch her bag-of-bricks teacher bag for good. You heard right – Tracy hasn’t taken her bag of grading home in over four months. And what’s better – she’s still getting everything done at school in about 43 hours a week. Now that’s breaking the teacher stress cycle. Tracy learned how to do this through the 40 Hour Teacher Workweek Club, and she’s not the only one. Don’t forget! Download your free Intentional Procrastination To-Do List System. All clickable links for free resources constantly request my email submission even though I am already subscribed and receiving MANY emails from your??? I am not finding this site very user friendly. Please help. When you enter your email address my system will email you a copy of the to-do lists. I’m having trouble with direct downloads on the site right now so this is the fastest & easiest way to get it to you. Wish that I had had this advice years ago. Wow. This is necessary, practical and useable. Could I please have a copy of this article. I would love to try these strategies this year! What do you mean by “put up names of students who would present problems (as explained in this post here)” in the START OF THE DAY section?